Lucky, lucky Andrew Lloyd Webber. He sets a Grand Guignol classic, Gaston Leroux’s “The Phantom of the Opera” to music that is lush with romance, witty in both parody and original composition, and ominous in its one ‘rock’ number, and it plays continuously for more than 25 years in both London and New York. Fashionable as it’s become to disparage “Phantom” or lambast Lloyd Webber for borrowing a strain or eight from Giacomo Puccini, the piece has passed the tests of time and popularity. Not to mention durability. I have seen Harold Prince’s original production of “Phantom” more than 20 times, five on Broadway, including one visit during the 21st century, the rest on the road. The show, which made its debut in London in 1985, holds up and never looks dated, shopworn, or neglected by stage managers. It always seems new, fresh, and satisfying. Lloyd Webber’s score may be sneered at by wags who equate disapproval with taste, but it remains varied and clever, blending the classical, contemporary, and modern in creative ways and containing several intoxicating numbers ranging from “Think of Me” to “Wishing You Were Somehow Here Again” and “The Point of No Return” in addition to the oft-sung “All I Ask of You” and “Music of the Night.” Charles Hart’s lyrics, augmented by Richard Stilgoe’s, relate the story while also having a touch of poetry and sensibility that is sadly missing from many scores that surfaced during “Phantom’s” life span. Forget the longevity and attendance records it’s broken. “The Phantom of the Opera” has proven itself to be a solid work of musical theater that earns its regard because of a score that can go from ravishing to comic and deft storytelling that begins with Leroux, receives theatrical texture from Hart, Stilgoe, and Lloyd Webber, and a brilliantly timeless stage interpretation by Prince. But, wait, there’s more to come. Luckier, luckier Andrew Lloyd Webber! “Phantom” producer Cameron Mackintosh, who can safely be said to have a keen theater mind, must know the Prince mounting of the musical could run forever and receive ongoing praise. He also knows that some shows that opened about the same time as “Phantom” are in their third revivals and have been looked at and interpreted by a new cadre of artists who have added to a work’s reputation while “Phantom” has retained one look for almost 30 years. For a 2013 tour of the United Kingdom. Mackintosh, following a pattern he began with “Les Miserables,” ordered an entirely new “Phantom,” a reconceived version directed by Laurence Connor who had a free hand to approach “Phantom” as if it was being given its original production. Connor had carte blanche to change anything, and Connor took advantage, retaining only the costumes designed by the late Marla Björnson and coordinated by Christine Rowland. Choreography. Sets. Lighting. Sound. Blocking. All new. And all sensational. That is why I brand Andrew Lloyd Webber as being so lucky. He wrote one work that has been performed without interruption or audience dissatisfaction in two of the English-speaking world’s theatrical capitals, and it now has Connor’s equally brilliant companion production to go with Prince’s excellent original vision. Two stunning productions of one work that has never been touched by anyone outside of Mackintosh’s purview. Extraordinary! Historic! Divine! Connor’s version of “Phantom” is not so much an improvement of Prince’s as it is a conscientious and theatrically savvy re-thinking. Connor’s staging is more intimate, more vividly presentational in terms of opera performance and dance, and more attentive to individual character traits, especially of Christine Däaé and Raoul, Vicomte de Chagny, who are given the chance to express more personality just as the Phantom is permitted to be more youthful and more physical. I, who admire and appreciate Prince’s rendition, enjoyed Connor’s as much and think it a great achievement in showing a classic in a new perspective, one that excites and illuminates while retaining romance and, yes, terror. Connor’s work deserves unbridled praise for the way it brings Leroux’s story closer to Lloyd Webber’s audience while keeping “Phantom’s” sense of lushness and, it must be said again, romance. The danger with being as lavishly positive as I plan to be is I may give the impression that because I think Connor’s work is so good and enjoy his take on “Phantom” so muchl, I am somehow diminishing or dismissing Harold Prince’s monumental accomplishment in endowing “Phantom” so much life in 1985. On the contrary. I’m an “and” person, not an “or” person. Both renditions of “Phantom” are works of genius. That each exists side by side, with Prince’s staging in its original theaters (London’s Her Majesty’s and New York’s Majestic) and Connor’s entertaining Brits and Americans on the road, is a testament to the appeal and durability of Lloyd Webber’s lovely and clever score, Hart and Stilgoe’s versatile lyrics, and Leroux’s magnificently gripping story. One fine production does not denigrate the other or lower it by any estimation. It only proves the flexibility of theater and that even an ongoing hit can benefit from a fresh look that gives Mackintosh two spectacular, intelligent interpretations with which he can enthrall audiences across the globe. 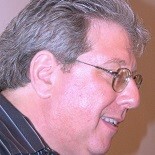 Laurence Connor made “Phantom” different while preserving all that made it great. He stayed within period, both in look and style of playing. He resisted, thank goodness, the 21st century penchant to overplay jokes and emotion and underplay the story or human connection, a trend that started with “Grease” in the ’90s and tends to cheapen good material. Connor found the essence of “Phantom” and brought it to his audience in a more immediate, less austere fashion than Prince did. Prince’s formal direction distanced people from “Phantom’s” proceedings and took an approach that made his production like a romantic legend. Even scenes played front and center on stage had a sense of telling a story that happened in the past. Connor’s work is more here-and-now and more flesh-and-blood. Even Raoul’s constant reminder that the Phantom is a man, a mortal, and not some extra-human monster with unusual powers, is brought to light in Cooper Grodin’s portrayal of the title character and Connor’s overall attitude towards him. You feel as if you’re watching a drama unfold instead of being shown a bygone tale. The characters and present and vibrant. They pull you into the action by the force of their performances as much as by the eerie world of the Phantom or the opulent world of the opera. Concern for Christine, Raoul, and even the Phantom is more palpable because Grodin, Julia Udine, and Ben Jacoby play their characters to be so authentically human. Connor places more at the front of the stage and makes opera and dance scenes a more integral part of Hart’s play and less a background that amuses until we can get back to the Phantom’s lair or a grand duet by Christine and Raoul. The overall story, the entire mise en scene, is clearer and more engaging. You see and understand more of the milieu in which the characters live and work. The opera scenes, all of which are a shrewd blend of parody and true artistry, add character and movement to the production. They are not just an amusement of diversion. They’re the setting that helps define an entire world, a world that is serious , tension-fraught, industrious, and artistic in a real way that offsets the bizarre life, behavior, and quarters of the Phantom. The result is greater depth and variety. You see and realize more of Christine’s alternatives and witness her as young professional making her way in the arts and having to compete and perform. The characters of opera diva Carlotta Giudicelli and her husband, lead tenor Ubaldo Piangi, become more important, palpable, and even sympathetic. Frank Viveros is particularly amusing as Piangi, a peacock who will go along with anything that will put him in the spotlight. Giving ancillary characters more to do enriches “Phantom” by endowing it with more facets, more opportunities to entertain directly and hold audience attention when the leads are less focal and more members of an ensemble. Opera scenes become welcome fun, their own reward, instead of comic relief. Viveros and Jacquelynne Fontaine as Carlotta have more ways to display their characters and contribute to the production as a whole. Their stories become interesting. They are more than singers or creatures of artistic temperament. They are performers fighting for their place in a new order and who have the Phantom’s opposition to them as one more obstacle to overcome. Once again, I remind that my admiration for Connor’s staging in no way diminishes my regard or appreciation for Hal Prince’s production. Connor has just made “Phantom,” an embarrassment of riches that can be thoroughly enjoyed in a way that is markedly different from the original mounting. Perhaps the greatest different comes in the choreography. Gillian Lynne, is 1985, concentrated more on stage movement than on dance. Even in the ballet scenes, there were few touches of dance as the center of attention. Scott Ambler has ample opportunities to add dance to “Phantom.” His ballets are more realistic and require more disciplined and exciting dancing. The second act opening number, “Masquerade,” is less formal and more engaging while blending more smoothly into the overall story of “Phantom.” The choreography in that number comments well on the action so far and the action to come and plays as an organic sequence, as opposed to an exceptional diversion, in the musical. The opera scenes in “Phantom” never received enough credit. Yes, of course I know all the charges lodged against Lloyd Webber in terms of “borrowing” from Puccini and others. I never thought much mattered because most of the mock operas composed for “Phantom” are entertaining. “Hannibal” both celebrates grand opera while teasing about its excesses. “Il Muto” makes delicious fun of stylized, comic opera that places women in pants roles and depends on sly wives and foolish husbands. The Phantom’s opera, “Don Juan Triumphant,” is actually quite good in my estimation and is simultaneously a funny spoof and fine example of contemporary works. Connor brings the opera forward. “Hannibal” is performed front and center so that Lloyd Webber’s jokes and homages are more immediate and clear. Connor’s opera is accessible. Framed by a gold proscenium that features architectural touches from L’Opéra de Paris, the “Hannibal” and the operas register as their own entertainment and let you see Carlotta and the dancers as more vital figures in “Phantom.” “Il Muto” also presents a precise picture of how the Phantom wages the opera wars he perpetrates. Connor finds the comedy in “Don Juan Triumphant” and stages a great moment when Julia Udine, as Christine, recognizes the Phantom not by his voice but by his hands, which are different in shade and shape from Piangi’s, her intended co-star’s. From Minute One, the auction scene, Connor’s reimagining of “Phantom” takes off and stays aloft for its duration. The famous opera chandelier in wrapped as an auction item, lot #666 — I wonder where the inspiration for that number came from — and the mechanical monkey in the music box is larger and more easily seen and enjoyed for the curio it is. Already, from its first lines, the new production involves you. It gets you interested in all that will take place and makes all that happens on stage a clear delight. The Phantom, and the anticipation of his appearance, are more organic elements in a total show that makes each scene count. Both Connor’s and Prince’s “Phantoms” stand on their own. About the only thing I missed from Prince’s version is the gondola ride through the candle-strewn lagoon on which the Phantom escorts Christine to his den beneath the Opera. A boat figures into Connor’s staging, but he has his characters reach it by walking down treacherous-looking open steps along the back wall of the Opera. You actually worry about the footing on the steps as the characters descend them. Even noticing they are on tethers from most of the way down does not relieve the tension. In a later scene, Jacoby, as Raoul, goes down the steps quickly, without the caution of a tether. That sequence adds to the suspense. Julia Udine does not play Christine as a sheltered hot house flower. She is a woman of experience who can be as headstrong and difficult as any opera diva assoluta. Udine keeps Christine down-to-earth. Her childhood as a musician’s daughter comes more into play, and she is middle class although she has brushed against nobility, e.g. Raoul. Refinement comes from being around artists more than by being born into the upper class. Udine’s Christine has poise, but she also has to struggle and compete for her place in the opera. She is realistic about her position as a dancer, and a rather inattentive one, who aspires to sing and who takes lessons from an invisible “angel of music,” she believes has been sent to fulfill and prophetic promise from her father. Because Christine is more than a heroine in peril, Udine can give her dimension and show moods and flashes of temperament. Udine’s show of strength, of common humanity, also renders Christine vulnerable. This Christine is not as hypnotized or controlled as her predecessors in Prince’s staging. She enters into the fire more knowingly and with some confidence she can take care of herself. Udine is charming in the role. Her vast experience in musicals shows is evident, and she uses a legit voice that can soar into operatic registers when called on to do so. Cooper Grodin is a more agile Phantom than the one to which we are accustomed. He is more than a grand figure who lurks with perfect posture and a formal air. He is a tall but rather slight human who has had to learn to outwit, and even terrorize, others to survive. Because of the way the Phantom’s first assaults are initiated, and how clearly Connor shows his murderous handiwork, Grodin’s Phantom loses both Christine’s and the audience’s sympathy earlier and more readily than Michael Crawford did in the original production. He also parries more with people, shows himself more readily content to show his presence, and displays more awareness than he is human and can be injured or killed. Grodin’s physicality was exciting. He doesn’t stand placidly and speak to Christine. His youthfulness and eagerness show.He moves around the room like a nervous and unsure suitor. He both surprises with this boldness and earns some empathy with his shyness and his self-awareness. Because he seems more human, and vulnerable, Grodin’s Phantom does not at first seem grotesque or off-putting. You don’t feel a chill when he first touches Christine although you do feel wary about the Phantom’s intentions towards her. Seeing him perpetrate mayhem, rather than having calamity occur offstage as if by magic, adds to the horror in “Phantom” but, again, makes the audience less sympathetic to the Phantom’s loneliness and longing. On opening night in Philadelphia, Grodin’s voice showed signs of strain. Notes and passages could be occasionally wobbly. My assessment leans more toward Grodin’s being fatigued than his being unable to handle Lloyd Webber’s score. 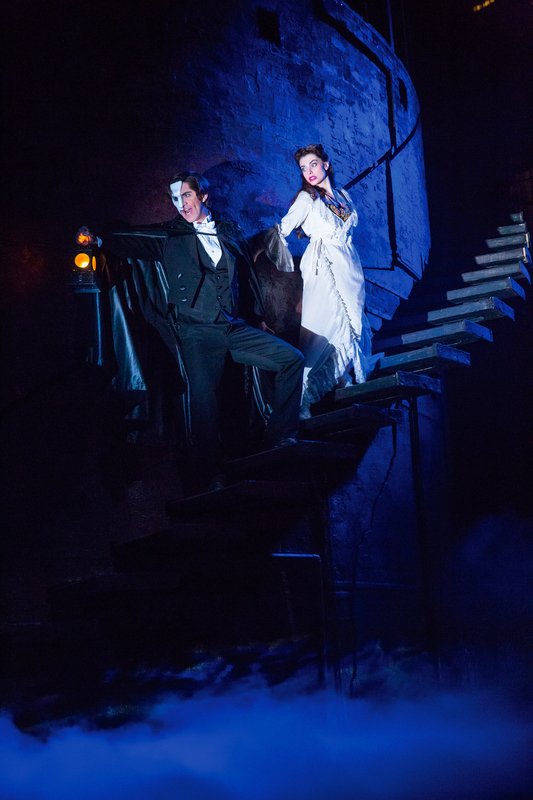 As he gets accustomed to singing the Phantom’s rangy vocals several times a week, he’ll acquire more stamina, and his singing should be truer. Wobbly or not, Grodin sings expressively. He also makes his Phantom more of a menace in that he seems impelled to violence by spiteful boyish pique, a motivation of “I’ll show you,” rather than by calculated evil. That makes some of the Phantom’s crimes easier to understand, but, surprisingly, does not earn him sympathy. Grodin’s Phantom is more of a villain because he doesn’t seem as disciplined and surgical in his designs. Ben Jacoby is excellent and cavalier-like as the sensible, self-possessed, cool headed, and commanding Raoul. Jacoby is as true a romantic figure as the Phantom is. He is a gentleman who can display ease and a sense of humor. He is a man of determined action who can marshal forces and accomplish his task. He is a realist who insists the Phantom is human and susceptible to bullets and strangling. Jacoby plays all aspects of Raoul, including his handsomeness and debonair ways, with equal aplomb. He is not an archetype. He is a full-blooded hero that, in conventional ways, is as effective as the Phantom. Grodin and Udine do wonderful work, but Jacoby’s Raoul is the revelation. 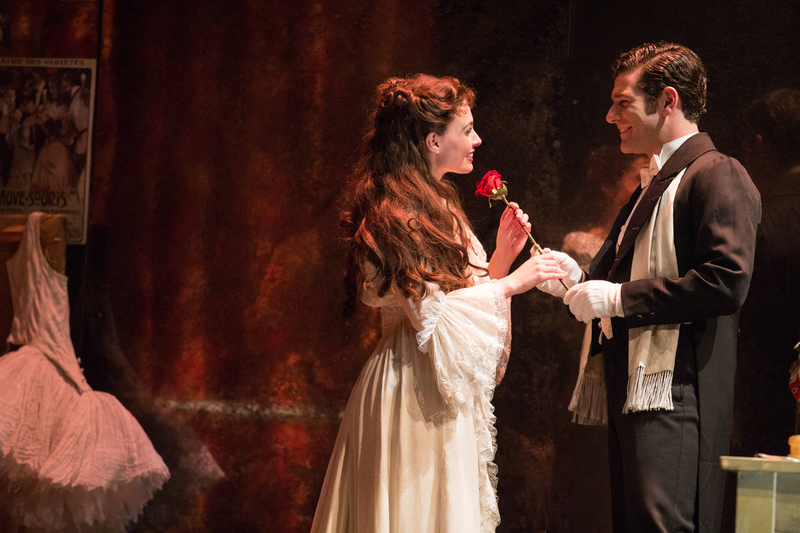 He makes the character so lustrous and amusing while showing Raoul’s playfulness and excitement to be with Christine. Jacoby’s Raoul is heroic. He is the brave and competent person you want near you in a crisis while being witty and romantic, at times simultaneously. Jacoby also brings out all of the sentiment in his songs. His “All I Ask of You” with Udine is superb, both vocally and in terms of how well both performers act their characters. Frank Viveros is consistently amusing as Piangi. He lets you see the singer’s ego and eagerness to please. Though Piangi stands by his wife, the diva Carlotta, when she is being criticized by the Phantom and removed from lead roles, Viveros expresses his support with a smile rather than with exasperation. He is always on hand for anything that would be tantamount to today’s photo op and loves the attention of the opera owners and the crowd. Viveros turns Piangi into a character instead of a hanger-on who fulfills a function rather than playing a role. His is a clever turn that always rated the right kind of notice. Like Viveros, Jacquelynne Fontaine is given opportunity to make Carlotta a more dimensional character. In Connor’s staging, Carlotta is more than a prima donna. She is a star who has a point to make and the voice to prove she deserves the leading roles she has become accustomed to playing. You see Carlotta as a woman instead of a type. Even though she retains diva traits, you feel a bit sorry when it looks as if she’s going to be denied her artistic due because of the Phantom’s preference and not because her time as a star has really passed. Scenes in the opera office, ones featuring Jacoby, Viveros, Fontaine, and Craig Bennett as opera owner, Firmin, and Edward Staudenmayer as his partner, Andre, have a new importance, and all of the above act their parts wonderfully. Linda Balgord, once upon a time the leading lady in Lloyd Webber’s “Sunset Boulevard” and “Aspects of Love,” brings wit and personality to the austere role of Mme. Giry, the dance mistress who is also the Phantom’s liaison and confidante. Because Connor gives the ballet and Ambler’s choreography more importance, Balgord’s Giry is seen more and in more conditions. She is always welcome. Paul Brown’s new sets bring all of the action closer to the audience. The red flock in the opera office is perfect. The roof of L’Opera is vivid. That staircase against the opera wall is downright frightening. Paule Constable’s lighting, combined with Nina Dunn’s projections and effects, add to the mood of Connor’s production. You can feel the heat of flames the Phantom seems able to create at will. Lights are often blinding in a way that enhances your experience watching “Phantom.” Mick Potter’s sound design keeps you guessing where the Phantom may be. “The Phantom of the Opera” runs through Saturday, April 12 at the Academy of Music, Broad and Locust Streets, in Philadelphia. Showtimes are 7:30 p.m. Tuesday through Thursday, 8 p.m. Friday and Saturday, 2 p.m. Saturday, and 1 and 6:30 p.m. Sunday. Additional performances are scheduled for 7:30 p.m. Monday, April 7 and 2 p.m. Thursday, April 10. Tickets range from $160.50 to $30.50 and can be obtained by calling 215-731-3333 or going online to www.kimmelcenter.org/broadway. This entry was posted on March 25, 2014 by nzoren in Theater Reviews and tagged Andrew Lloyd Webber, Ben Jacoby, Cameron Mackintosh, Charles Hart, Cooper Grodin, Frank Viveros, Gaston Leroux, Grand Guignol, Harold Prince, Jacquelynne Fontaine, Julia Udine, Laurence Connor, Linda Balgord, Mick Potter, Musical Theater, Nina Dunn, Paul Brown, Paule Constable, Richard Stilgoe, Scott Ambler, The Phantom of the Opera.